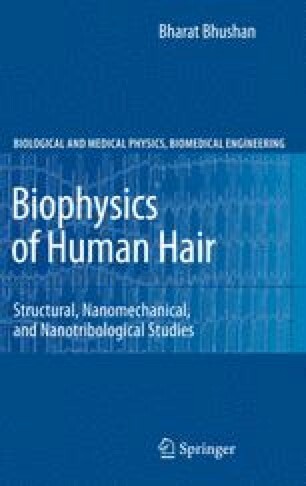 Nanomechanical characterization of human hair using nanoindentation and nanoscratch provides valuable information about the hair fiber itself, as well as how damage and treatment affect important mechanical properties of the fiber (Wei and Bhushan, 2006;Wei et al., 2005). In Sect. 4.1, the hardness, Young’s modulus, and creep results for both the hair surface and cross section are discussed. In Sect. 4.2, the coefficient of friction and scratch resistance of the hair surface is presented for unsoaked and soaked hair. In Sect. 4.3, stress–strain curves and AFM topographical images of virgin and damaged hair during tensile deformation are presented.